This post originally appeared in Design Milk in 2016, by Vy Tran. I consider myself a “packing enthusiast.” There is nothing that jumpstarts my pre-vacay excitement like packing for a trip, because it’s the start of one! However, travel issues like flight delays and luggage that magically break right at check-in can instantly make me wish I was back at home instead. 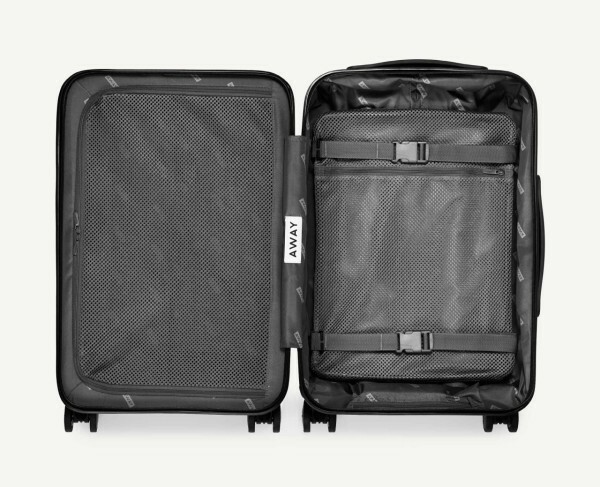 Away, a new travel brand founded by Forbes’ 30 Under 30 and Warby Parker alumni Jen Rubio and Stephanie Korey, aims to make my travels less stressful and more enjoyable from departure to arrival, starting with the Carry-On suitcase designed in collaboration with Box Clever. Away has a direct-to-consumer model that offers a lower price point than other premium brands without sacrificing quality or design. Its introductory Carry-On is made with a 100% virgin Makrolon polycarbonate hardshell, YKK zippers, and virtually silent Japanese Hinomoto® 360° spinners. 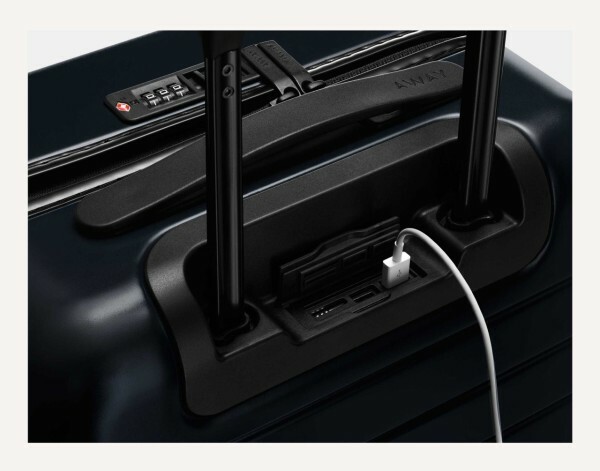 It also features a TSA-approved integrated lock and portable 10,000 mAh battery capable of charging my devices up to 5 times (no more watching those occupied outlets like a hawk!). It’s clear that Away has a solid product (even Jay Z thinks so; he’s one of its investors), but it also has an inspiring vision for the brand. I asked the founders and Box Clever founder/principal designer Bret Recor where is the future for Away and what defines good design. How did the idea to disrupt the premium luggage industry come about? JR: As very frequent travelers, we personally struggled with the lack of compelling options in the market: high-quality bags were too expensive, more affordable bags fell apart, and no brands resonated with the way we think about travel. We knew from a brand and consumer experience perspective that we could build a company that didn’t exist in the luggage space. Then we decided to tackle the industry’s egregious markups by going direct-to-consumer. Who is Away designed for? SK: When we researched how people traveled and what would make travel goods perfect, we talked with men and women, college students to seasoned CEOs, and domestic and international travelers. Our goal was to learn from a wide array of travelers to truly learn what would make a carry-on perfect for nearly everyone. 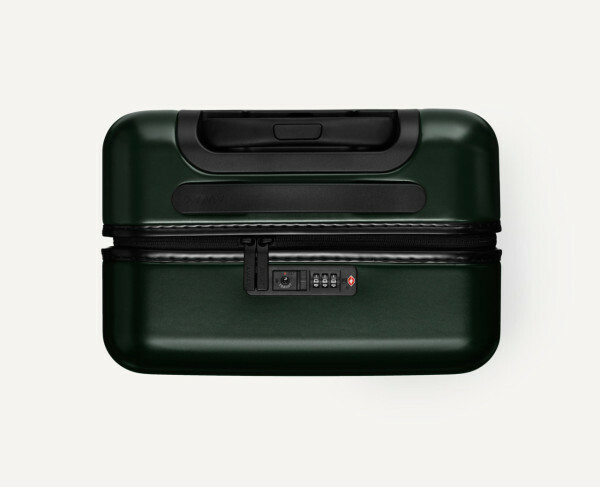 How did you and Box Clever approach the process of designing a smart-looking bag? 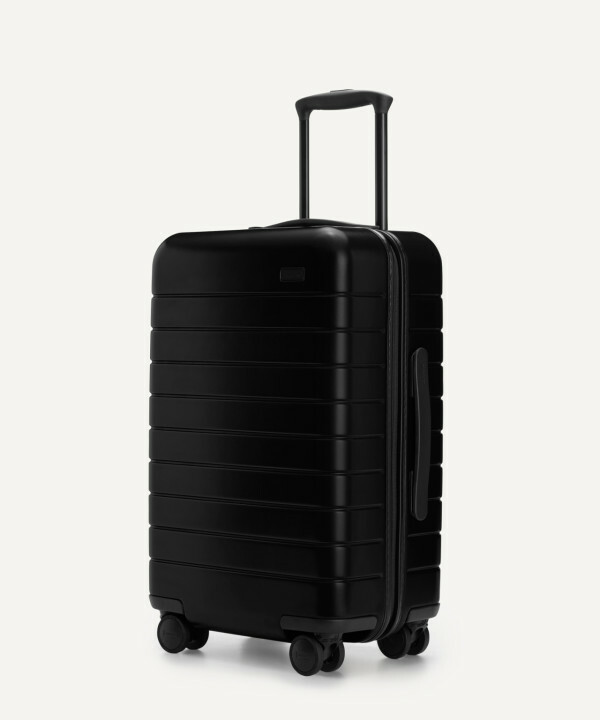 SK: We learned that consumers wanted a clean, beautiful, and simple product that had all of the functionality they needed, but none of the extra, unnecessary gimmicks you often see pushed by luggage brands. They wanted four smooth and durable wheels, high quality zippers, and an interior that made organizing their belongings seamless. Box Clever did an incredible job turning those mandates into an unprecedented product. BR: Box Clever are experts in designing for the human experience. We partnered with them to have the industrial design work closely with our brand language to create an offering that is culturally relevant and aesthetically balanced. What’s one of the challenges you’ve had so far in designing the products? SK: Because packing is a largely individual activity, best practices are not typically discovered from person to person and as a result the way people pack varies widely. We learned that the top priorities for most people were maximizing how much can fit in a carry-on and being able to keep their laundry separated from their unworn clothes. We ended up both in-setting the wheels and adding a compression pad to maximize interior packing space and designing a patent-pending built-in, yet removable, laundry bag that can also be compressed. BR: Like all first products for new companies it is always difficult to get all the parts to come together without compromise. We explored many additional features that ultimately did not make it into the initial offering. There is plenty more to do in future products. What do you think defines good design and how is it reflected in the Away products? JR: Good design is driven by behavior, centered on experience, and human-focused. At Away, we believe in making things beautiful and functional, creating objects that are emotionally and technically meaningful, and continually thinking about how people will interact with us. BR: The product must live up to the promise of the brand. Box Clever specializes in brand driven design which ultimately leads to great design. The simplicity of the Away brand is not just a logo applied to a product. Instead, the product is a reflection of the brand principles and vice versa. 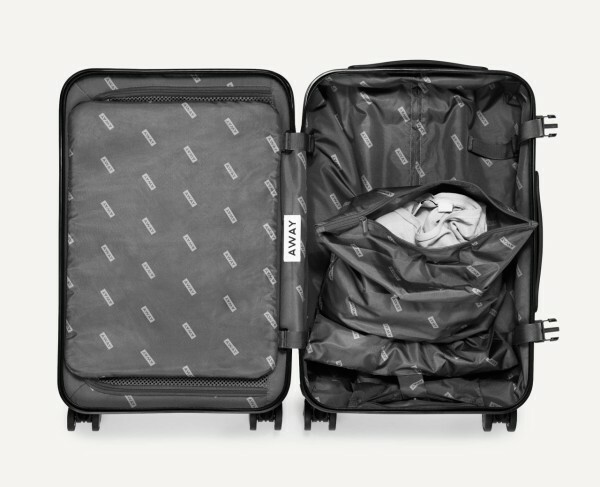 You’ve mentioned before that Away is not just a suitcase company. Where do you hope to take the brand? JR: Our mission is to make travel as seamless and joyful as possible, and luggage is just the beginning. It’s not just about a well-designed suitcase and all of its features and components (although we’re very proud of our first product)—it’s about how that suitcase fits into a lifestyle and empowers you to travel better. It’s in how we talk, think, speak, and act about travel. In the short term, we’ll branch out into other travel goods, but in the longer term, it’s really up to what our customers—our global community—needs from us! Do you have any advice for someone who wants to redesign a common item and disrupt the industry? SK: If a legacy industry is under-serving customers in terms of product design, consumer experience, and inflated markups, it’s a great opportunity to do things better. My best advice is to have a singular focus on the consumers and what would make that product and experience perfect for them. It requires significant research to truly understand that piece, but it’s essential. BR: You need to be passionate about what you are going to do and find great partners to help you work through the mission to create something that truly stands out. 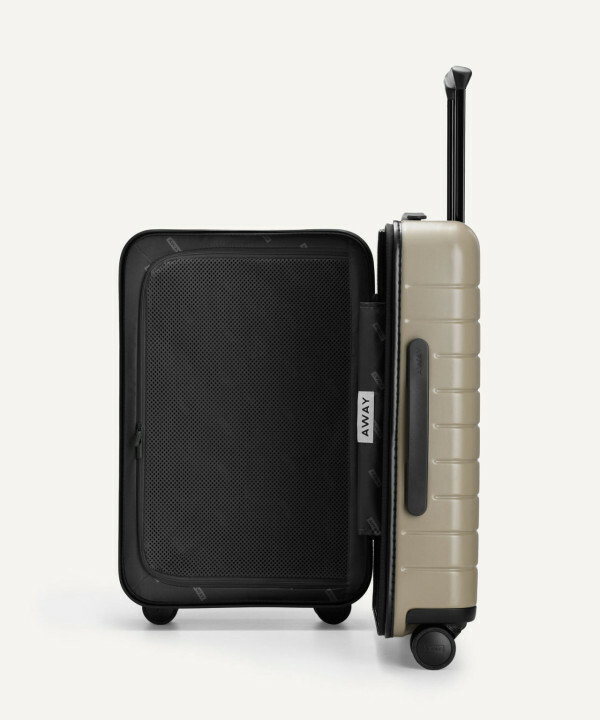 Away launched its Carry-On luggage this week and its check-in luggage will launch Spring 2016. To purchase, visit AwayTravel.com.